“The quote ‘Your mind can only take you as far as your eyes can see, whether it’s fantasy or reality’ is a quote that I wrote for myself a long time ago before I started college. I always looked at college as just another stepping stone, something that I needed to just get a degree. A few weeks into my first semester I realized that I could use this experience for much more. I realized I could build bridges that could help me later on and possibly last forever. I met people just as motivated and talented in other fields. I became more inspired to do my work because I was surrounding myself with people as confident as me! 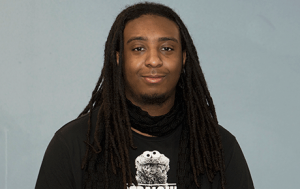 My experience here at Ramapo has truly been magical –the moments I create with friends to the nights that I’m able to look up at the stars.” – David Francis-Vaughan ’20 is an Electronic Art and Animation major. David’s work has been featured in the 60 Second Intl. Film Festival 2017-18 and The Hayti Heritage Film Festival. He is a member of the Animation Club.